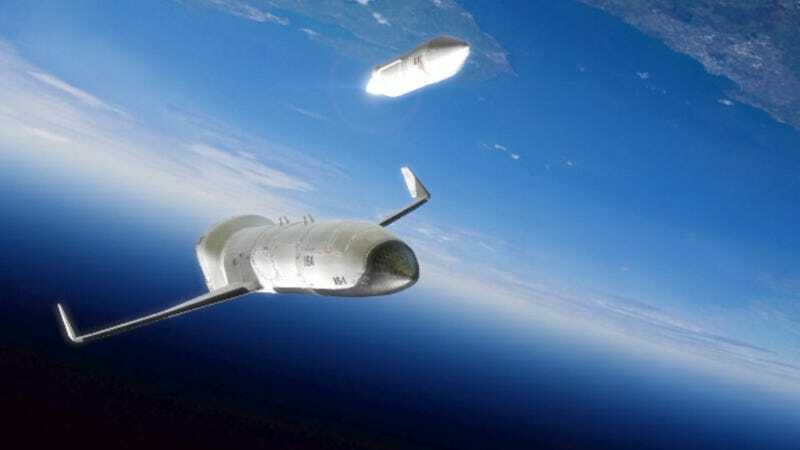 In an effort to reduce satellite launch costs, DARPA has awarded three companies with a $4 million preliminary design contract to develop the XS-1 Experimental Spaceplane — a reusable, unoccupied booster that functions similar to modern aircraft. The three companies are The Boeing Company (working with Blue Origin, LLC), Masten Space Systems (working with XCOR Aerospace), and Northrop Grumman Corporation (working with Virgin Galactic). The XS-1 will be a first stage launch vehicle capable of flying to hypersonic speeds at a suborbital altitude. Then, one or more expendable upper stages would separate and deploy a satellite into Low Earth Orbit (LEO). Ideally, DARPA wants it capable of lifting small satellite payloads between 3,000 to 4,000 pounds — and at a cost of less than $5 million per flight. An autonomous booster will carry the second stage and payload to high altitude and deploy them into space. Then, the booster will return to Earth where it'll be scooped up and prepared for the next flight. Technical goals for the design stage include flying 10 times in 10 days (wow! ), flying to Mach 10+ at least once, and launching a representative small payload to orbit. In an era of declining budgets and adversaries' evolving capabilities, quick, affordable and routine access to space is increasingly critical for both national and economic security. Current satellite launch systems, however, require scheduling years in advance for a handful of available slots. Launches often cost hundreds of millions of dollars each, in large part to the massive amounts of dedicated infrastructure and personnel required. The Experimental Spaceplace program is meant to help the U.S. military overcome these challenges, while creating an entirely new paradigm for more routine and affordable space operations. The Space Shuttle program is now most certainly in the rearview mirror. DARPA plans to hold a Phase II competition next year for the follow-on production order to build the vehicle and conduct demo flights. The U.S. Military's advanced concepts research wing "expects the performers to explore alternative technical approaches from the perspectives of feasibility, performance, system design and development cost and operational cost."